Every one of our Yosemite couples asks for help when filling out their Yosemite wedding permit application, so I put together these instructions to help! 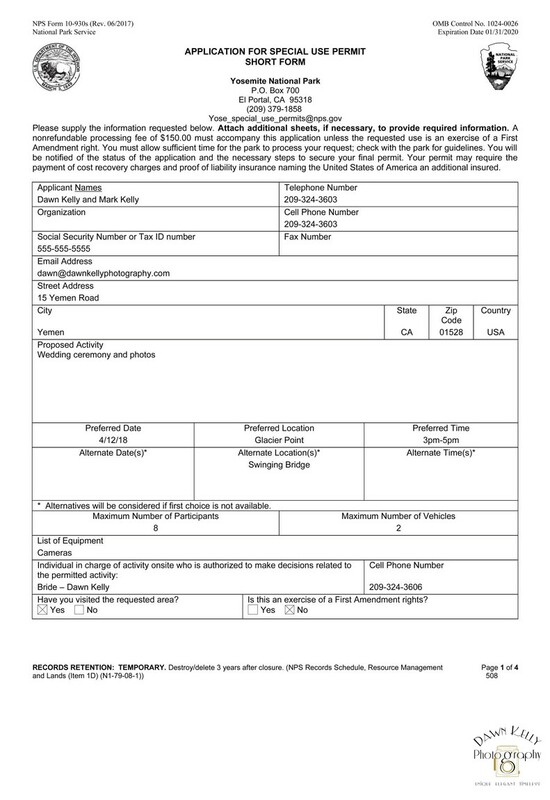 Below is a sample of the form, filled out as if I were applying for a permit. I will talk with you about these details, such as ceremony time and location, when we do our video chat planning session. Alternate Dates: You don't have to list alternate dates. Alternate Location: You only need to list one alternate ceremony location, and we will talk about that in our video chat. Preferred Time: They issue the permits for a time frame, not a specific time. Once we decide on your ceremony location, you'll put a time frame in that spot. Maximum Number of Participants: This number should include your photographer, videographer, and officiant. Maximum Number of Vehicles: The bride and groom always ride around with me and my assistant/officiant all day in the park, so we will be in one car. You just need to add up your guest's cars and estimate. List of Equipment: They're asking this in case we have external lighting or anything else that would affect the situation. I only use cameras and lenses, so just put "Photographer's Cameras." Individual in Charge: If you have a wedding planner, you'll put their name and number there. If not, list the bride as the person in charge. Go to the online form on Yosemite National Park's web site (under "Weddings," it's called "Permit Application.") fill it out and print it off. There is no option to send in your application digitally, so you'll need to mail it to the PO Box on the form.